I've mentioned that I'm building a huge British army for Salute. Here are the light troops, part-based - the Britons will advance up the hill, screened by a mass of raw slingers. 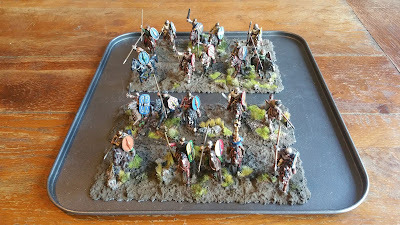 The 45 slingers on the left have been re-based onto my BatBases for the 20cm grid, but need extra grout and flock. Last night I found myself musing that I'm re-basing some of these minis for the third time. :-/ The 45 to the right are new minis, based and recently grouted with my patent BigRedBatGunk. Of the rest of the army, I now have roughly 530 warriors painted, with 90 more out with Shaun McTague. I'll need to get my skates on to finish, in time! If you are coming to Salute and would like to play in the game in one of the two sessions (AM/PM), please drop me an email (the address is on the left of the page). If you are able to help me run it, please mail me- I have a couple of spare entry tickets! 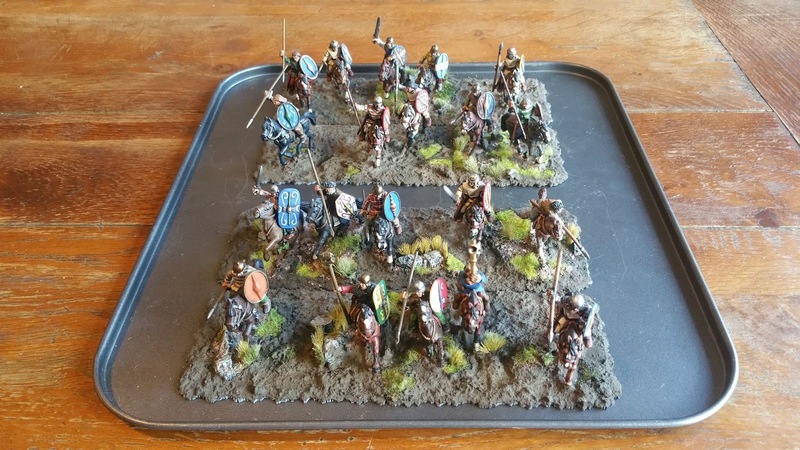 The troops are great, and the basing really looks outstanding for these open order troops! Fantastic job! Celts take a lot of work too!